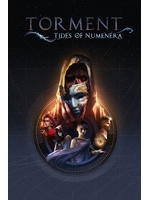 Techland Publishing has just announced its collaboration with inXile Entertainment in order to publish the retail version of Torment: Tides of Numenera. The RPG is expected to launch on PC during the first quarter of 2017. "I’ve been impressed with Techland and am pleased to be collaborating with them’ – says Brian Fargo, inXile Entertainment CEO. ‘Bringing a game of such scope and depth to the international market is a major undertaking, and we wanted to be sure we partnered with professionals who knew how to cater to the global community. Techland has been a great partner and their track record has convinced us they are the people we want to have at our side." • A World Unlike Any Other -- journey across the Ninth World, a fantastic, original setting, with awe-inspiring visuals, offbeat and unpredictable items to use in and out of battle, and stunning feats of magic. • A Rich, Personal Narrative -- thoughtful and character-driven, the story is epic in feel but deeply personal in substance. The philosophical underpinnings of Torment drive the game both mechanically and narratively. • Reactivity, Replayability and the Tides -- your choices matter, and morality in the Ninth World is not a simple matter of “right” and “wrong”. Torment is a deeply replayable experience that arises naturally from your actions throughout the game. • A New Take on Combat -- plan your way through hand-crafted set-pieces which combine battles with environmental puzzles, social interaction, stealth, and more.